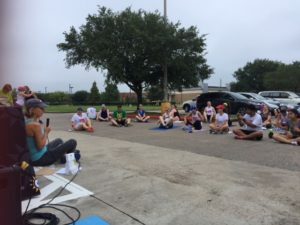 We had the pleasure of talking with the Fort Bend Fit marathon training group about mindful running/walking and stretching, and how mindfulness can be used to improve performance. Body awareness, or the ability to sense the body’s posture, joint and muscle movement, even state of mind – is essential for injury-free running. We practiced embodying this mindful awareness during our post-run stretch routine, scanning the body for stress, stiffness, pain, or just niggles. 2. Applying this awareness to running or walking helps us to notice when we collapse out of posture as we begin to fatigue, or clench our hands or jaw, or when we become lost in thought and drift away from the present moment. 3. Deep breathing is our most important tool. Using breath as our focus is a sure way to stay present and aware. We breathe rhythmically through the nose in step with our strides. Deep rhythmic breathing can lower your heart rate so that your perceived effort feels less stressful. Mindfulness is paying attention to the here and now, not dwelling on the past or future. It is only from the perspective of the observer that we can discern our movement, posture, attitude. From the position of observer, we coach ourselves to refocus, recall our training objective for the day, adjust our form, pace or stride, so that we can run effortlessly in balance and avoid injuries. This effortlessness is sometimes called flow, or in-the-zone. There is still much debate about whether to stretch, not to stretch, before, after, or how. My approach never forces the muscle or tendon to give. Forcing can cause micro-tears and inflammation, so we explore our limits gently. Runners or walkers often feel the need to stretch because of perceived stiffness. However, tight muscles are often secondary to another muscle being weak and imbalances in flexibility or strength. Carefully chosen yoga sequences can help improve mobility after a hard run. Yoga helps balance the repetitive movement of endurance workouts by involving major and smaller stabilizer muscle groups. You can experience the stabilizers in action in poses like high-lunge or one-legged poses like dancer pose. Are you ready to give mindfulness a try? 1. Bring your full attention to the present moment. 2. Now scan your body. Feel the tone of the muscles, any stiffness or flexibility in the joints, energy levels, stress, heart rate. All the time observing your breathing and staying present. 3. Based on feedback from the body scan, confirm your intent for the workout. Should you go hard or easy today? What-about-my-training-program, you say? Switch the days around or skip it. It’s essential to match your workout to the body’s state to preventing injuries, over-training and to stay motivated. As you ease into the run or walk, your goal is to stay present in the here and now. Whenever you notice that the mind has wandered away from your chosen focus, which it will often do, gently bring your attention back to NOW. Be aware of niggles, or even negative thought patterns, as they arise. Take care of them before they become full-blown injuries (or dramas!). To jog us back into the present moment we use the breath. The breath is always there. Add a mantra if you like > Breath-Aware-Present. Take stock of how your run felt and how the practice of mindfulness factored in. I’d love your feedback so let me know how it’s going and if you need any help nailing this! To learn more about mindfulness and how to get started we invite you to attend our Free Introduction to Mindfulness on September 29 at 1:30-2:30. Contact me to reserve your spot. Our courses take various forms and include weekly class series, afternoon workshops, and a full day retreat. Please subscribe to our newsletter to be notified as we add new classes. Find upcoming classes here https://lifesagift.me/events/. Please email me with any questions. If you would like to bring any of these events to your workplace, church, school, sports team, hospital – we work with you to customize courses to suit your needs.